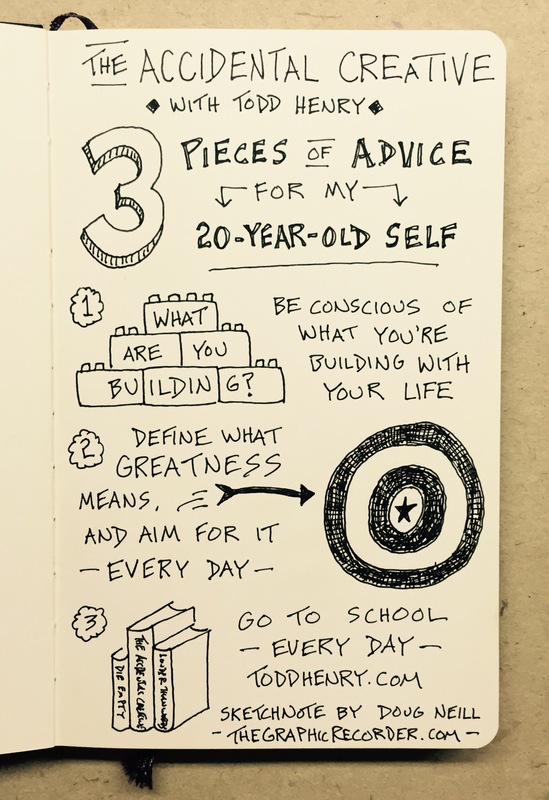 In this sketchnote I capture the three pieces of advice that author Todd Henry would give to his 20-something self (and that he still reminds his 40-something self). Purpose: To see if I’m following those pieces of advice myself (I’m 29 right now so time is running out!). Let’s see how I’m doing so far, and where there’s room for improvement. #1: Be conscious of what you’re building with your life. I feel like I’ve spent the past 4 years trying to figure out what I want to build with my life, and I’m slowly homing in on what that thing is. In recent years I’ve focused heavily on what I’ve been building in my professional life – Verbal To Visual. I’m now ready to be more intentional about what I’m building in my personal life – good timing considering that I just moved out of my parents’ house and back up to Portland, Oregon. Hey there, full adulthood, good to see you again. #2: Define what greatness means, and aim for it every day. This reminds me of another favorite author and podcaster of mine, Jonathan Fields. The question he asks his guest at the end of every interview: “What does living a good life mean to you?” Two different ways of asking the same question, it seems to me. Here’s my attempt at defining greatness for myself (again, heavy on the professional side): continual improvement of my craft via the regular making and sharing of useful things for those I’ve chosen to serve – the learners and makers gathering at Verbal To Visual. #3 Go to school every day. Pretty solid on this one. I feel like I live in a school of my own creation. I read every day, listen to podcasts every day, practice new skills every day. Todd Henry has had an incredibly positive influence on my life and work over the past few years. I highly recommend that you check out his work.